2018 recruit Joel Farabee scored twice—including the game-winner—as Team USA defeated Finland, 4-2, in the gold medal game of the IIHF World U18 Championships. The win gave the US its seventh U18 title in the past nine years and turned the tables on the Finns who beat Team USA in the 2016 semifinal en route to winning gold. Team captain and 2017 recruit Brady Tkachuk stripped a Finn of the puck and pinpointed a goalmouth pass to Josh Norris for a 1-0 lead. 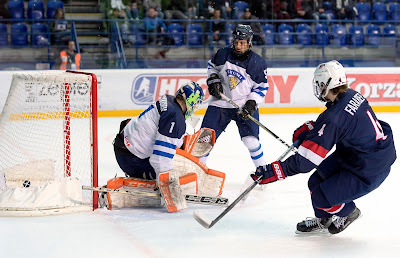 That was doubled when Farabee, who led the NTDP U17s with 31 points (18G, 13A) before his call-up to the U18s, drove to the net and one-timed a centering pass. In the second period with Team USA shorthanded, Farabee head-manned the puck to 2017 recruit Logan Cockerill, whose slick return pass sent Farabee in alone for a shot through the goalie’s five-hole and a 3-0 lead. Farabee, who earned player-of-the-game honors, scored 17 points in 21 games with the U18s. Tkachuk finished the season with 53 points (25G, 28A), while Cockerill had 27 (14G, 13A) and a third 2017 recruit, defenseman David Farrance, had 36 (7G, 29A). For Tkachuk, Cockerill and Farrance, the next hockey stop is Agganis Arena. Three future Terriers—forward Trevor Zegras and defensemen Case McCarthy (photo) and Alex Vlasic—have accepted invitations to join USA Hockey’s NTDP U17s for 2017-18. 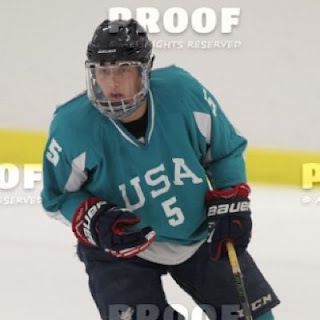 Zegras played for Avon Old Farms last season and led the team with an 18-24-42 scoring line. McCarthy had 14 points for the Buffalo Junior Sabres 16Us, while Vlasic had 13 points for the Chicago Mission 16Us. Another BU recruit who had attended the NTDP evaluation camp, defenseman Cade Webber (The Rivers School), reportedly also was invited to join the U17s, but declined the invitation. 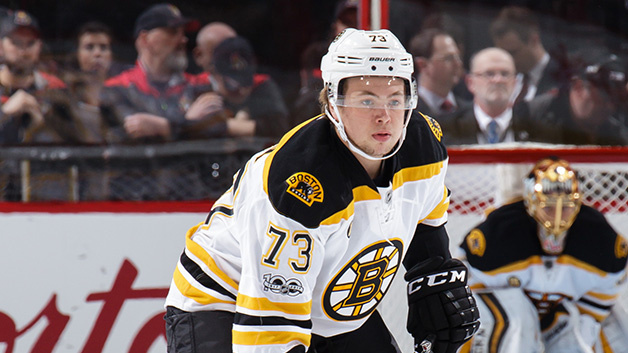 The season came to an end for former Terriers and current Bruins Charlie McAvoy and Jakob Forsbacka Karlsson as Ottawa eliminated Boston, four games to two. McAvoy had three assists in the series with the Senators, playing extensive minutes in each game. Karlsson didn’t dress for any playoff games and skated in one regular-season contest. After being named the 2016-2017 Women's Hockey East Coach of the Year (an award he also received at the end of the 2009-2010 and 2010-2011 seasons), former Terrier goalie (1984-1987) and current Providence College head coach Bob Deraney has been given a contract extension by the Friars. He just completed his 18th season with the Friars and is the winningest coach in Women's Hockey East history. Please share the detail of Ice Hockey World championship 2017 and also share the link to Watch Switzerland VS Slovenia online My favorite Ice hockey teams.